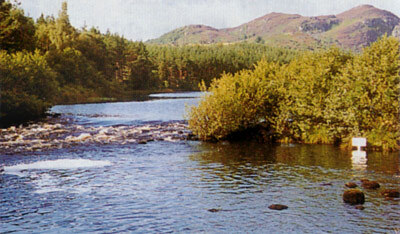 Loch Achonachie Angling Club controls the fishing on the Upper Blackwater from below the outflow of Loch na Croic to above Rogie Falls, a distance of about 1¼ miles (2km). 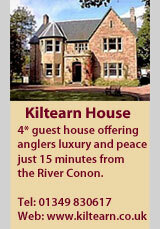 The fishing is double banked, but the best access is from the left bank, which is reached by forestry roads from Contin. The club allows a maximum of 9 rods at any time on the Upper Blackwater beat. 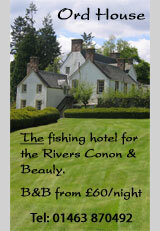 The Upper Blackwater opens on April 1st for trout fishing and fishes through to September 30th. Salmon generally do not arrive in the beat until June, and cannot be fished for prior to June 1st. August and September are historically the prime months. The fishing is generally by fly only, but spinning is permitted during spate conditions when water levels are above the red markers on the gauge boards. Best flies can be summarised as the 'usual suspects' - Ally's Shrimp, Cascades, Stoat's Tail and Silver Stoat. The 5 year average for the Upper Blackwater up to and including 2011 is 84 salmon & grilse, with 187 fish caught in the 2010 season. The best salmon caught in recent years was a fish of 19½ lbs caught in 2005 by Mr Jamie Bell from London - a visitor!